As of April 2013 I have visited 32 of the 52 capitals of Europe and managed to have a Guinness in every one of them to date. The last place I went to was Skopje in Macedonia. The next place I will visit is Sarajevo in Bosnia. 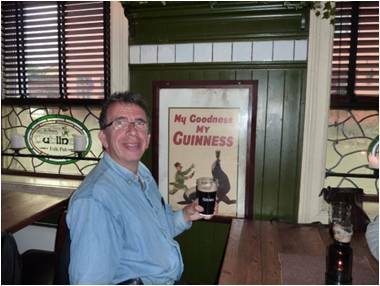 I started in 2004 in Dublin, the home of Guinness and was kindly given a free tour of the Guinness Storehouse brewery. I then went to Sofia-Bulgaria later that year. In 2005 I visited Torshavn in the stunning Faroe Islands followed by Vilnius, Lithuania (don’t mention the food poisoning) and the whacky Tirana, capital of Albania. In 2006 I was lucky enough to go to the huge city Moscow – Russia followed by the tiny capital of Vaduz in Leichtenstein. Then came Belgrade – Serbia. When I drew up my list of countries Serbia & Montenegro sere one but had since separated. I therefore made a trip down to Podgorica by rail. What a great journey that is. Late in the year I went to Zagreb – Croatia. In 2007 I had a marathon year having Guinness in Warsaw – Poland (Brrrrrr), Monte Carlo – Monaco, the stiflingly hot Kiev in Ukraine, my home town of Cardiff – Wales and finally Lisbon in Portugal. In 2008 it was time for a Guinness in Istanbul – Turkey (yes, I know it’s not the capital but it is in Europe whereas Ankara is not). After that it was Tbilisi in Georgia, and Vienna, Austria. The fist destination in 2009 was Athens, Greece followed by Luxembourg and then the expensive Bern in Switzerland. In 2010 I visited one of Europe’s smallest countries – Andorra and made a mad dash to Madrid from there as Spain’s capital was the next to get picked out. Next came Oslo in Norway and then Copenhagen, Denmark followed by Tallinn, Estonia in December. 2011 saw me visit Berlin, Germany then Baku in Azerbaijan and finally Nicosia in Cyprus. In 2012 I made it over to Amserdam and the Haag- Netherlands just in case there is an argument over which is the capital, This was followed by Ljubajna in Slovenia and Stockholm in Sweden. I used to take an emergency can of Guinness with me in case I coudn’t find any. This has become more difficult with te ban of taking liquids in hand-luggage onto planes. I almost came unstuck in visiting Macedonia in that although there were some Irish Pubs, thay had all run out of Guinness. I eventually found some on sale in a supermarket. Phew! Otherwise I would have had to return to keep the challenge going. There are still 20 destinations left ‘in the hat’ ranging from Armenia to Iceland and Malta to Finland. That should keep me going for a while.